Ibanez is commonly associated with fine tuned metal guitars that have became synonymous with a lot of popular guitarists over the years. What most people often forget is that they also have a pretty solid offering of effects pedals in their line of products. One we are talking about today is a phaser that tends to offer a somewhat different experience than your usual pedal of this type. The gizmo’s different approach to the idea of phase shifting is exactly what makes it one of the most practical and straight forward phasers on the market today. Even with its quirky nature, it still compares well to the rest of the popular phaser pedals. When you first take the Ibanez PH7 Phaser out of the box, the fist thing that you see is its utilitarian enclosure. There is no pain, no graphics of any kind, just bare metal. This simplicity is interrupted only by the control knob designation and a small PH7 logo. The controls available are somewhat standard, with some exceptions. Again, the names of the controls enforce that utilitarian theme. Every knob is labeled with straight forward names that leave no room for confusion. Starting left to right you have Speed, Depth, Feedback, and Level. Underneath all of these, there is a mode switch with two positions. The knobs are self-explanatory where Speed determines the frequency of the phase shifter, while depth allows you to make those dips deeper. Feedback and Level both impact the intensity and strength of the effect. Mode switch allows you go from a more vintage four-stage phase shifter to a more modern six stage one. Additional controls combined with a solid piece of circuitry make for a pretty awesome effect pedal. Ibanez PH7 Phaser packs a great performance that can be modified in a lot of ways, including its nature. Mode select switch is not there to give you one more tone shaping options, it’s more of a dimension multiplier that doubles the adjustment capabilities you have at your disposal. Even with least amount of tinkering, you can get a pretty good phaser with a natural dynamic sound and lots of fidelity in terms of clean or distorted signal. Overall, Ibanez PH7 Phaser comes across as a practical and quality-made piece of gear. 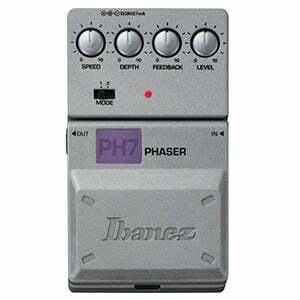 It’s not flashy, it’s not packed with various control knobs, but Ibanez PH7 Phaser is a pedal designed to be used. In that context, the quality of its performance is stacking rather well against other models in its category. This phase shifter has everything it takes to be placed within the ranks of the greats. For more info about the Ibanez PH7, click here.